Photo of the day #1. To showcase the awesome light in my office. 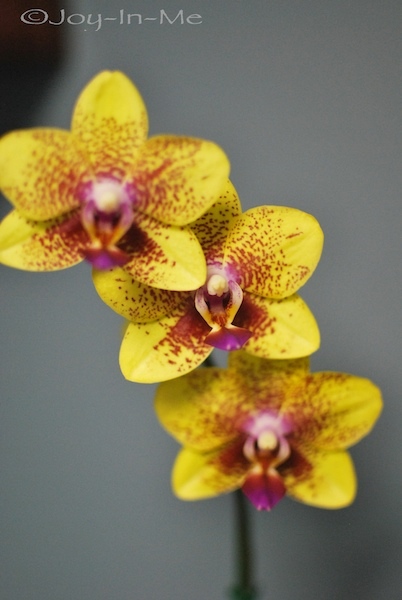 [that was sarcastic] This lovely orchid sits on my desk and pretty much brings all the color into the office. I love it 🙂 How I got it is actually a funny story. John spoke at a Greek Orthodox church a month of so ago. We sat with the nicest older lady–who just went on and on about her life and about how she talks to much (really, that’s what she talked about). Neat lady. Anyway. On our way out, she told me she had fallen in love with John and since she had fallen in love with him she wanted to give me a gift. This orchid. She even asked him for his phone number. I hope she calls–I’d love to have that lady over for dinner. What a hoot. Check out my dear friend Laura’s blog-she’s doing “photo of the day,” too! Happy Friday. We’re off to Disney!